This is the title - Just Add Love - Holocaust Survivors Share their Stories and Recipes - and here is your sneak-peak!!! Hope you love it, because we all do and we are super-excited! Have to credit to photographer Dave Mane, graphic designer Amanda Hampel and of course Marysia Segan, her sister Eve Chapman and grand-daughter Louise Davis, who baked their way on to our front cover. We’ve done the interviews, the photographs, the writing, (most of) the editing, and we’ve signed a distribution deal with Australian publisher Black Inc Books. And now on 23 October we launch a Kickstarter campaign to fund the printing, so we can bring these inspiring women’s stories and recipes to the world. Crowd-funding, as I’m learning, is a way for people to pre-order their copy of a book they like, and to ensure it gets printed. Clever, huh? We’ll keep you informed as we count down - omg, it’s only 20 days!!! Please let me know if there are other people you know who are also interested in food and history and who should be on our mailing list. Message me here, or send an email to info@foodislove.co, or go to our FB page — Food is Love Australia and leave a message there. Am sharing this recipe because 2 people, from different parts of the world, have asked me for it. And honestly, I can’t think of anything that would better go with a sneak-peak of our book than a recipe for Chocolate Yeast cake. In fact, in that funny way of life, it’s the perfect recipe for today. The Babka, or Kugelhupf, is a delicious and quintessentially Jewish cake. I know that because 5 or 6 grandmothers from this project have baked it for us! You swirl chocolate sauce through a sweet yeast dough, and bake it with a hole in the centre. It's called Kugelhupf after the shape of its tin (like a bundt or angel cake tin). In Jerusalem they produce a version called Krantz. Kugelhupf and Krantz, more like Marx Borthers lawyers than cakes! But so, so good... a cake for a celebration, for comfort, for family, for reassurance, for delight … there’s no occasion it doesn’t improve! This is the recipe of Sydney grandmother Mimi Deitz. Family and friends know her as a great baker and this is one of her specialties. It takes time and commitment to bake with yeast, so if someone bakes this for you, it's a sign of love. I met Mimi through Thea Riesel, with whom she’s been friends for 75 years! Just let that number sink in. They slept in adjoining bunks as teenagers in a Japanese prisoner of war camp during World War Two, and today in their 90s, they live around the corner from each other in Sydney. Thea knows when Mimi is baking this yeast cake, just as she knows every thing else that Mimi does, since they pop in to see each other almost every day. Or call. Or email. Or text. They are mothers and grandmothers - Mimi is a great-grandmother - but their longest relationship is with each other. “Mimi became my friend before the Japanese came to Indonesia. She’s my friend till today, and she is the real cook. She is still baking yeast cakes, I don’t know why you're wasting your time with me!” Thea said the first time we spoke. In our book, Just Add Love, we tell their stories together, in tribute to their friendship. Quantities: A sachet of active dry yeast universally contains 7g / 1/4 oz or 2 heaped teaspoons of granules; fresh yeast is 3 times the weight of dry - so one 7g sachet of dry yeast is equivalent to 20 g fresh. Mimi used to bake this in a kugelhupf tin, but now she often makes it into strudel shape. A little milk or egg, or sugar and water (2 tablespoons sugar in ¼ cup water) This is useful if you want something that will be shiny, but also kosher. 1. Heat the milk or water until lukewarm. 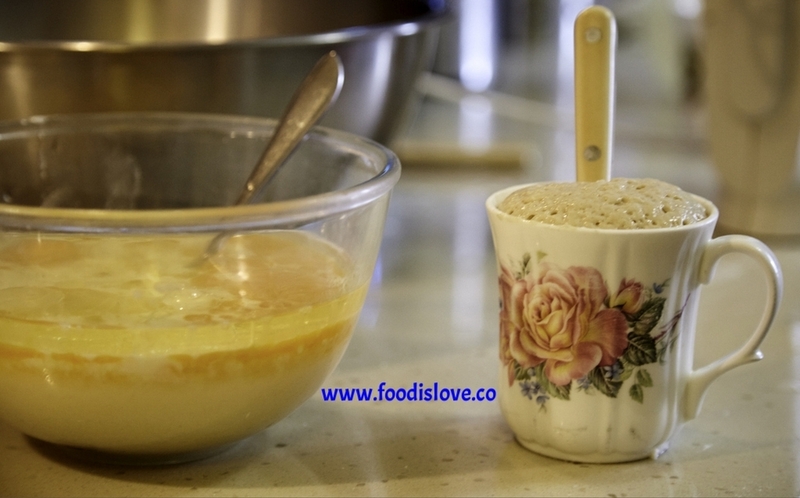 Take ¼ cup warm liquid, 1 heaped tablespoon from the sugar, and mix till dissolved. Add yeast and mix till it dissolves too. 2. Take 1 heaped tablespoon from the flour, and add to sugar-yeast mix. Leave for 5 minutes till it ferments, and reaches the top of the cup. 3. When the mixture has cooled a little, add the yeast mix and eggs. Add the salt to the flour and add in batches. Mix. 4. Knead for 5 minutes, by hand or using an electric mixer fitted with a dough hook. When the dough is elastic, oil a dish, and put it in. Cover with plastic wrap. 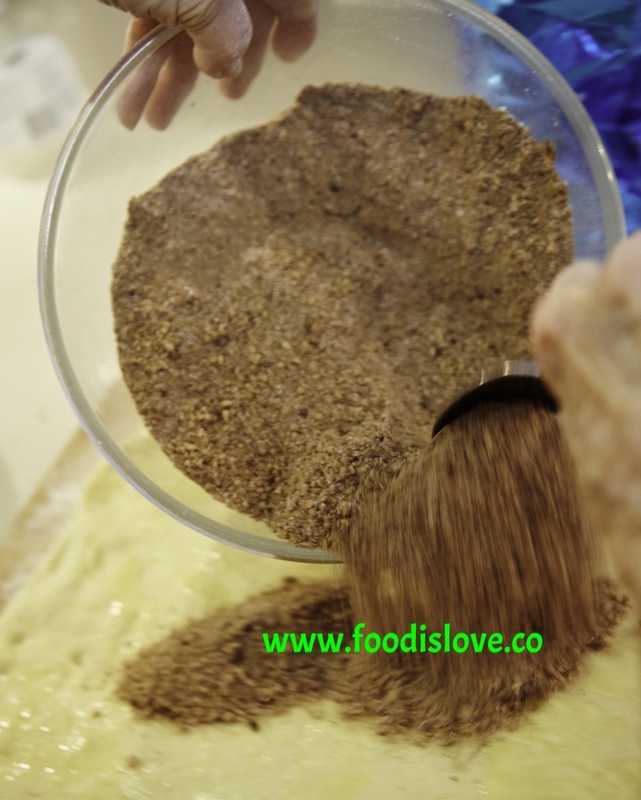 Leave a gap between the dough and the plastic so that it is able to breathe without drying out. 5. Leave to rise until it doubles in bulk. It will take somewhere between 30-60 mins, depending on the weather. Plus a little melted butter, for brushing and 1/2 cup water for sprinkling. Divide dough in two. If making the strudel shape, roll into a rectangle, with the long side as long as your pan. Flatten with a rolling pin to a thickness of 1.2 cm / 1/2 inch ie thin, but not see-through. Brush with a little melted butter. Sprinkle half of the dry chocolate mixture evenly up to the edges of the dough. “Sprinkle” about 1/4 cup water on top, using your fingers. Roll up gently but firmly like a strudel or jelly roll along the long side, so it will fit snugly in the baking pan, or can be coiled around the hole in your angel tin. Alternate folding: Mimi also folds it another way. Roll the dough up along the long side, from both sides, so it meets in the middle and fold one side on top of the other, then roll it out till it is the size of the pan. She says this produces a better result. 6. Cover the loaves with a wet tea towel and leave to rise in a warm place for an hour or so. This gives you a nicer texture if you have time, but you can omit this step if you don’t. 7. Preheat oven to 325 F/ 170 C. Brush with milk or egg wash, if using. (No need if making a kugelhupf shape, as it will be on the bottom.) Bake for 30-40 minutes, till it is brown on top and hollow when tapped. Check at 30 minutes. 8. If you are using sugar syrup, cook water and sugar together till blended, on stovetop or in microwave. Baste cakes with water only after they come out of the oven. It's fun to do for a change, and the result looks gorgeous. The steps are the same as in the previous recipe, until you have to fill and shape the roll. 2. Follow step one above for rolling out the dough. Spread with half the chocolate mixture, then sprinkle with nuts and cinnamon. 3. Using both hands, roll up the dough, along the long side of the rectangle as you did above, till you have a roll the size of your cake tin. 4. With a knife, cut the roll into two, lengthways, from the bottom to the top, leaving 1.5 cm / 3/4 inch joined together at the top. You are looking at two open, connected halves. 5. Braid, with the chocolate side out. Lift the right half over the left half. Repeat with the left half over the right half till you’ve finished the roll. Press ends together to seal. Lift and place in tin. 6. Repeat with remaining dough. Leave to rise for an hour covered with a wet tea towel, if you have the time. (You can still get a great result without a second rising.) Pre-heat oven to 325 F/ 170 C. Bake for 30 minutes. If you are using sugar syrup, baste the cakes after they come out of the oven. I’ve seen this baked by 4 different grandmothers, and tried it twice myself, and I can say that the old adage is true. Practice does make perfect. Lots of practice. The second time, I rolled it out properly and used a wet filling. This improved it, but if the chocolate is not the right consistency it won’t work well either. Once you have a sauce of the consistency of Nutella, you are in the zone! So here's what I've learnt: roll the dough out as thinly as you can, roll up the roulade as tightly as you can -- that will give you the best chocolate to dough ratio. And that’s true whether you bake as a strudel or in an angel tin. These recipes - plus a gluten free version - will be in our new cookbook Just Add Love when it comes out early next year. And please spread the word about our Kickstarter launch! Leaving you with some photos of my mother and my nephew, visiting me here in Jerusalem. Is there anything better than seeing a grandmother with her grandchildren?